The late Alexander McQueen had a penchant for fetching inspiration from the natural world. Much of his work is punctuated by elements of nature, in the form of show themes, embroidery or embellishment; his work was enriched by a vivid sense of place, as if it was possible to suffuse nature organically into a fashion show. His successor, Sarah Burton, has a similar inclination. (Her stamp on the house has been far less impactful but she lends a specificity to her clothing which allows them to quietly stand the test of time.) Her recent collections have been influenced by her travels to Iceland and her fascination with paganism. Naturally, it is permeated with a certain richness one has come to expect from her. Richness is Burton’s equivalent to McQueen’s theatricality. The clothes were distinctive, distinctly McQueen. There were pointed shoulders and slim-fit double-breasted suiting; sleeveless jackets in the finest leathers didn’t live up to seasonal expectations but were rather beautiful, and classically on brand. 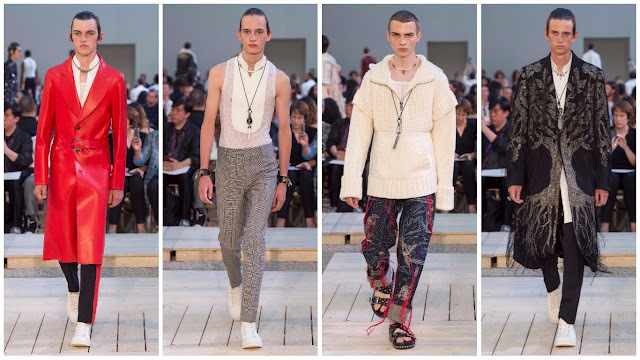 The broderie anglaise that dominated the middle of the show and the exemplary knitwear towards the end are newer house staples, ones which, as aforementioned, are quietly timeless. Themes of nature are reflected in womenswear also. The advertising campaigns, lensed by Jamie Hawkesworth and previously David Sims, celebrated nature and its purity. It is clear to see Burton aspires to enrich the environments with her embellished outfits, the way she effortlessly blends luxurious fabrics with gold, silver, platinum hardware. Impossible to deny is the appealability of her clothing—despite frustration with her simplification of the brand, commercially the brand is taking a delightful approach to craft and product; for example, the red leather coat’s softness translates through a computer screen and the rich decoration of a wishing tree embroidery on a black coat is mesmeric. One considers the argument that Burton has transformed McQueen into something largely forgettable. Her predecessor, the founder, was an era-defining virtuoso who consistently strengthened the commercial aspect of things without sacrificing his unabashedly dramatic creative streak. Burton’s work has come into its own and although it may not be as memorable as it was before, the beauty of it is worth appreciating for ugly fashion is rife and this is far from that.